First, she imagined it. Then a killer made it real. Rowan Smith is living in a borrowed Malibu beach house while her bestselling novel is made into a Hollywood movie. A former FBI agent with a haunted past, Rowan thinks she has outrun her demons. But fiction and reality collide when a dismembered body is found in Colorado: the real-life victim had the same name, occupation, and looks as a character in Rowan’s novel. By the time the FBI, the LAPD, and her own private bodyguard gather around her, another person is killed–again, the murder ripped from the pages of Rowan’s book. In the company of a former Delta Force officer with secrets of his own, Rowan faces an excruciating dilemma: the only way to chase down the tormenting killer is by revisiting the darkness of her past–and by praying for some way out again. After the prey is chosen, the hunt is on and the kill is certain. Before I dive into my rant, I DO want to point out that things got better after the halfway point of the book. Just in case anyone is wondering about the average rating. The first half of this book actually merited a 1.5 Star to 2.0 Star rating. The dialogue was awkward and unrealistic, and there was too much of an emphasis on the romance and our characters' dramatic woes. It really derails a reader from the main, crime thriller conflict presented from the first chapter. It also didn't help that I found the characters, except maybe John Flynn and Quinn Peterson, extremely irritating. Things continued to be quite rocky even as we hit the midpoint of the book, although with the serial killings in the background, there was always a niggling need, as a reader, to continue on. That didn't mean that I enjoyed much of that first half of the book, and I found that our characters had a lot of trouble prioritizing their duties and responsibilities. Rowan was so adamant about keeping her secrets, or not being protected, or doing her own investigations, that it was making me roll my eyes pretty badly. She's an ex-federal agent, and I have a hard time understanding why she wouldn't give up pertinent information that may or may not be connected to an ongoing investigation. What she did could really be construed as obstruction of justice, truth be told. People were dying, and more people would continue to die. And predictably, the worse ended up happening because she wasn't forthcoming with her knowledge, no matter how tragic events had been for her. Understanding only goes so far when lives are at stake, and you have a chance to do something about it. Meanwhile, her own fatalistic approach to the entire situation really could have put a lot of people's lives in jeopardy. A bodyguard was hired to help protect her, and as much as she detested that, Michael Flynn and his siblings were there and required her cooperation in order to do their job. But her constantly stubborn attitude was so vexing because putting herself in the line of fire also meant putting others in the line of fire. I'm not sure why she couldn't understand that, especially since she used to be a federal agent, who probably had to deal with difficult victims and witnesses as well. It probably also didn't help that Rowan spent a lot of time being kind of whiny, unprofessional, and stupidly reckless. Also, I lost respect for her the first time she decided to just point a gun at her hired bodyguard. Then lost respect for her even more when she whipped her gun out again and and pointed it at one of the characters' heads just because he pissed her off. Talk about anger management issues. Rowan may be an ex-FBI agent, but she's still touted as justice-seeking and all good and all that. What the hell is she doing pulling her gun on random, innocent people just because she got pissed off? Truthfully, ex-fed or not, she should know better and have better respect for the power she wields with her weapon. You don't just point guns at peoples heads just because you get pissed off! Over-dramatic much? Meanwhile, our first bodyguard, Michael Flynn, spends more of his time mooning and male posturing than actually doing his job as a bodyguard. It kind of made an impact, because the contrast between Michael and his brother, John, felt so deliberately placed that you could just feel the author trying really, really hard to maneuver John into the main male love interest role, while including a pathetic excuse for a love triangle into the mix. This polygonal romance was truly unnecessary in light of everything else that was going on. I also found Tess Flynn very immature and bratty, even if her concerns were well-founded. She acted like a childish brat rather than a professional. The security business is not for her. The overall crime thriller was rather predictable as well, and I'm not sure if it's because the formula is familiar, or if the build up to each new "surprise" twist was just so poorly lain. It wasn't hard to figure out what would happen as the book progressed, as well as who the serial killer's identity was. But as I stated at the beginning of the post, as the book progressed, I started finding the book more tolerable. The writing felt less juvenile, the dialogue less awkward, and the characters less irritating. I still don't like Rowan, but she stopped making stupid decisions (for a millisecond or two, maybe), and the men stopped being lead around by their male ego anatomy. I AM quite interested to know what happened between Quinn Peterson and Miranda Moore, though, purely on a romance back story way, which means I will more than likely pick up the next book in the Predator trilogy. I feel like Allison Brennan just isn't for me, though, as I didn't really get into the first book I picked up by her, Love Me To Death, the first in the Lucy Kincaid series. But when I read her joint collaboration with Laura Griffin, Crash & Burn, the first book of the Moreno & Hart series, I found I liked her part of the book more than Griffin's--and I'm and avid follower of Laura Griffin crime thrillers. So I decided to hop in and try Allison Brennan again. 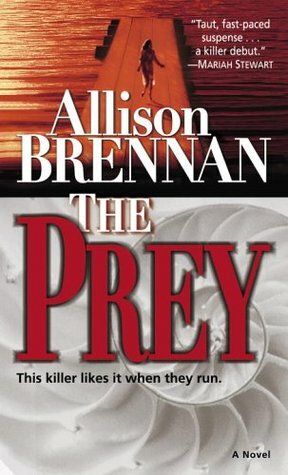 Unfortunately, either because The Prey was her debut novel, or because I just can't get into Brennan's writing style, I'm not sure. I found the beginning of this book just as detached and impersonal, and deliberately over-dramatic, as I had found Love Me To Death to be. Of course, I also found the book improved as the story progressed... just like Love Me To Death. So... Well... I don't know what to make of it right now, but I may pick up the next book in this trilogy just to give Brennan another whirl.